When I went to Anandashram in Aug 1988 due to office hassles (one of the numerous times I was overstayed and chucked out), it happens that sb fell down (first time?) and broke his hip just a few days after I left, and didn’t give darshan for weeks. Though Venkamma wrote me two letters at that time, she didn’t mention anything about his fall! She mentioned how Onam went well and the cows came for Krishnashtami. In letters she wrote me from Whitefield where she had been taken in a near-death state (her first illness leading to several more over the next few years), she wrote that all tests were done and all was OK. I am fine. Yesterday they did all tests and found you don’t have anything. Dr. Shantamma said you must take a few more days of rest. She said there’s a danger that your disease could spread to others. Because of this, take a few days rest. Whatever you want, I will send. This girl (Seva-Dal) is with me only. I have no trouble. 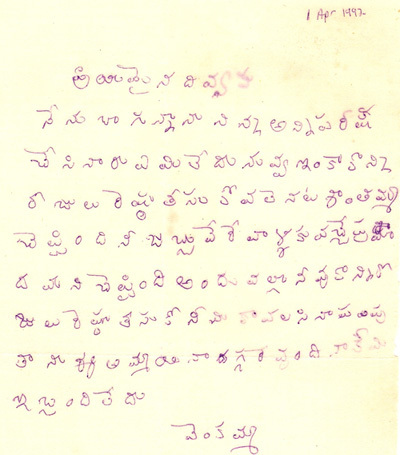 The original letter in Telugu written in Venkamma’s own hand is scanned here (click on thumbnail to enlarge). Telling Divya that she was healthy while she knew she had typhoid can hardly be correct behaviour? Adding that she could be contagious (and had a disease) seems like an April Fools trick. I consider that this well shows the naive but tricky mentality that prevailed in SB’s family, not uncommonly among Parthi villagers too. To learn the conditions under which Venkamma was left to die by SB, with only Divya to attend her, read the letter written by Divya to her parents at the time. See some very revealing excerpts about Venkamma scanned here from Eileen’s letters. Comment on the very revealing letters: After reading Divya’s accounts of life with Parvatamma, Venkamma and the female side of Sai Baba’s family on her Wattpad letters, one must conclude, that life with them was far from being one of light, love and ‘supreme peace’ (Prashanthi), as one would have been led to expect by all the hype in the biographies and accounts put out under Sai Baba’s supervision. That Divya was able to countenance this after having been brought up to believe in the highest ideals of Indian spirituality without losing faith in this family and its ruler (SB) is remarkable . To stay and contend with the many most unpleasant challenges and frequent very hard words that were thrown at her by Venkamma, to persist in serving her selflessly and putting up with diverse accusations by this demanding woman, can only be understood on the basis of the indoctrination that all SB followers have to adopt and extend to themselves if they wish to remain aspirants for salvation from all the ills of the world. It says a lot about the tolerant attitude of Eileen Weed, her determination to do good, strength of purpose and truthfulness. These qualities have no doubt been important in her being able to overcome the entire spiritual fraud involved and ‘bounce back’ without falling into depression or another guru’s clutches. This entry was posted on May 15, 2013 at 11:11 am	and is filed under Sathya Sai Baba. You can follow any responses to this entry through the RSS 2.0 feed. You can leave a response, or trackback from your own site. With all the information you are taking the pains to spread around, I can say it is a personal choice to embrace ignorance and blind faith if people decide not to verify their beliefs and read what is available. Years back, I too would immediately turn a deaf ear and close down information that would be anti-ssb.